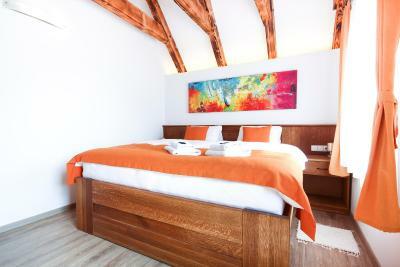 Lock in a great price for (Ne)vinná kavárna – rated 9.2 by recent guests! 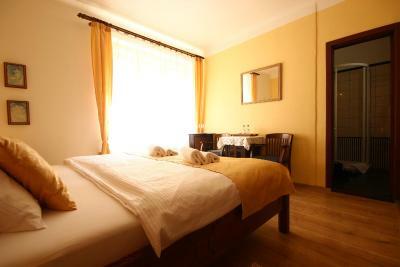 Located on the main old town street zone, in a quiet corner, this hotel offers a cozy experience. 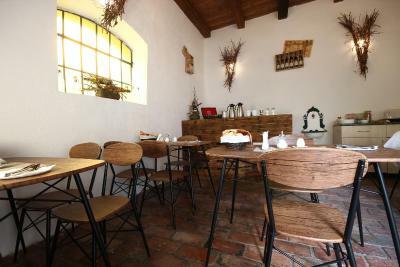 The café, which also serves as the breakfast area, as well as check-in zone, is beautifully decorated, and we tasted some great wines and local cheeses there. 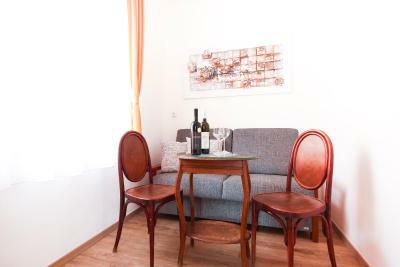 The rooms are neatly decorated, clean, spacious, and are even equipped with wine glasses! The bathroom was clean, and nothing was missing - clean towels and soap were provided. The bed is big enough and comfortable, and separate linens are provided for each person (which we had to figure out). 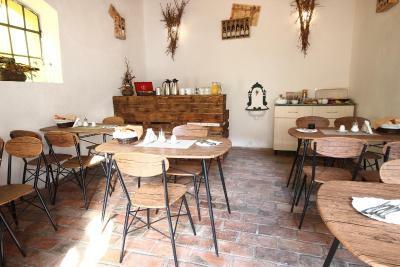 The breakfast was phenomenal, as this is a family-run business, we got to enjoy some freshly home-baked pies, as well as a wide selection of continental breakfast goodies - including a good selection of teas, freshly brewed coffee, and cold orange juice. The owner was very helpful and sweet and made us feel at home. Great location! Everything you want to see and do in Mikulov is right on your doorstep. 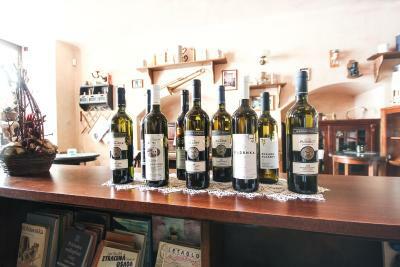 And you have a good selection of wines available in the café downstairs, which you can enjoy on your balcony (if you stay in the room we chose), on the square, or indoors. The room was spacious and well laid out. My only (tiny) complaint is that the shower head shoots water over the shower door! 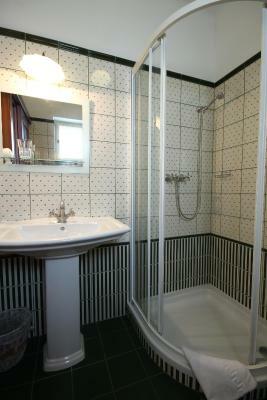 The rest of the bathroom was conveniently laid out, though. The location was perfect. Mikulov is a beautiful small town. Well worth a visit. Accommodation is on the lovely town square. Rooms are clean and comfortable. For the price this is an excellent value. Don't miss the bakery next door. Really nice place to stay during the long journey. Very clean and comfortable. Breakfast was tasty and staff was very friendly. The hotel was in the middle of this lovely town! I would recommend it. We liked absolutely everything. 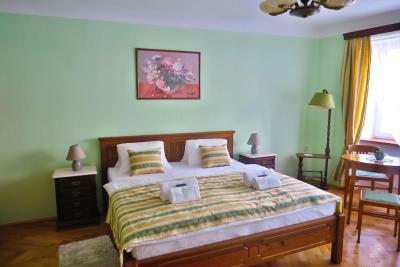 Cozy small place, very clean and comfortable rooms, nice always asmiled owner always ready to help. We would definitely want to stay at this same place if we are back in that area again. Our room was spacious and had a beautiful bathroom. The bed was super comfy. We were grateful for the small fan they provided as it was quite hot. We needed an iron and the one they had was broken, but they made sure they brought us another in time. Excellent service. 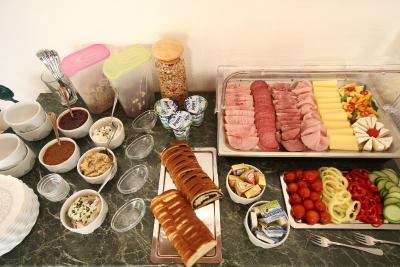 The breakfast was delicious with plenty of choice. The location couldn't have been better. It's right in the main square and only 2 minutes walk from the castle. Just above a beautiful little wine bar. 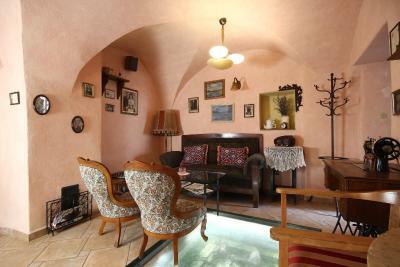 The place is the heart of nice and cozy town Mikulov, close to nice castle. We were traveling and spent on our way further one night there. The staff was friendly and helpfull. Atmosphere was realy stylish and cosy. After long travel It was quite romantic to have glass of wine in inner terace. We would definetely recomend the place. 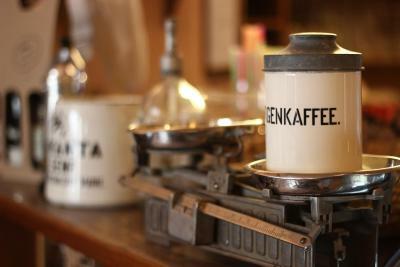 Located in the center of Mikulov on the main square, (Ne)vinná kavárna houses a Wine and Coffee Bar located on the ground floor. The bar offers bio fair trade coffee. Free WiFi is accessible throughout the house. 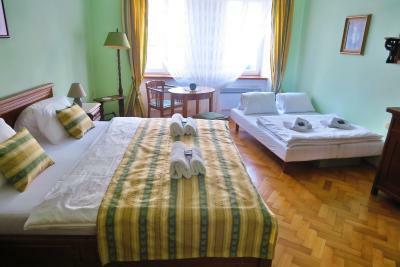 Rooms are fitted with wooden furniture and a private bathroom with a shower. Guests at (Ne)vinná kavárna can relax on a terrace. The nearest restaurant is 350 feet away. A bus stop can be found within 984 feet, while a train station is 1,650 feet away. 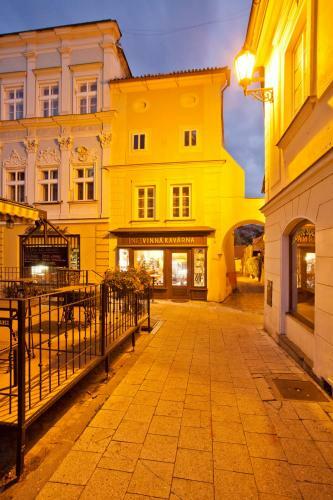 Jewish Cemetery and the Synagogue can be reached within a 10-minute walk. The Holly Hill is 0.6 mi away. The Lednice-Valtice Area listed as a World Heritage Site by UNESCO, as well as Moravia Water Park are both a 15-minute drive away from the property. Pasohlávky, a popular tourist destination, is at the distance of 11 mi. 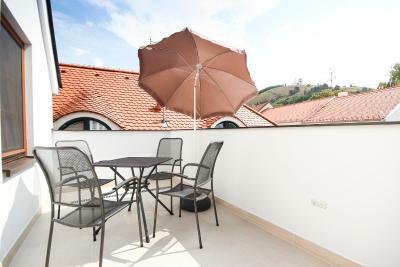 뀐 Located in the top-rated area in Mikulov, this property has an excellent location score of 9.7! 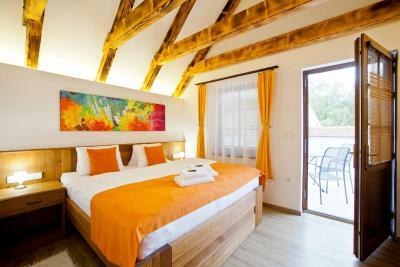 When would you like to stay at (Ne)vinná kavárna? 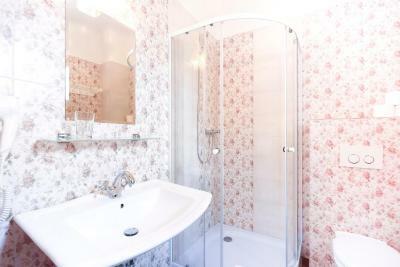 This room features wooden furniture and a bathroom fitted with a shower. Public parking is available at a location nearby (reservation is not possible) and costs EUR 0.40 per hour. 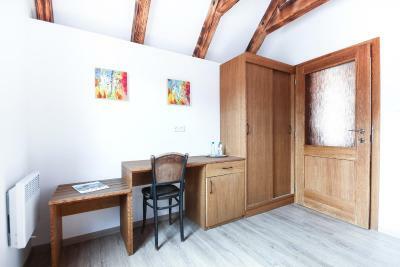 This double room features a seating area. 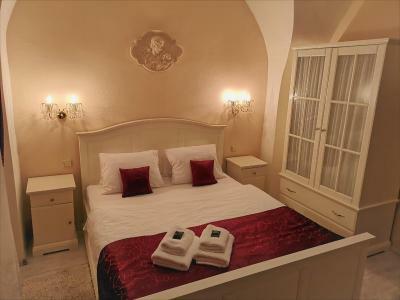 Extra bed is available in this room type (see Extra Bed Policies). House Rules (Ne)vinná kavárna takes special requests – add in the next step! 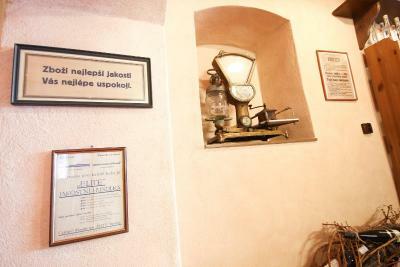 (Ne)vinná kavárna accepts these cards and reserves the right to temporarily hold an amount prior to arrival. Please let the property know your expected arrival time at least in advance. Contact details are stated in the booking confirmation. Guests are kindly asked to park their car at Svobodova Street. Please inform (Ne)vinná kavárna of your expected arrival time in advance. You can use the Special Requests box when booking, or contact the property directly using the contact details in your confirmation. Beware: it is forbidden to access the street the hotel's at by car (we were lucky not to get a ticket), so you'll have to walk with your baggage from the nearest paid public parking. But this has nothing to do with the property. 1. The curtains are pretty but only cover about 1/3 of the window, so there was too much light from the square outside to have a good quality sleep at night. 2. I guess we were the only visitors that night, 5 adults with 3 kids. The breakfast was tasty and even exquisite, but rather scarce. 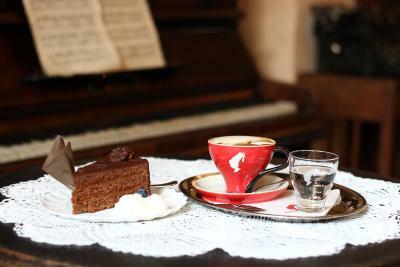 When I came down one more time for another cup of tea within the breakfast hours, was taken aback by a lady serving the breakfast, who didn't let me have it - took a pack I had already chosen out of my hands! She commented in Czech, so I am not sure I managed to understand exactly what she said, but the general meaning was no more tea allowed, I guess. And that was particularly surprising considering my totally obvious 7-months pregnant belly... 3. 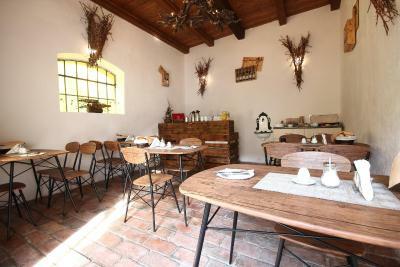 The staff hardly speaks any English and is generally well-trained, but not really welcoming or friendly. Very nice and cosy room design, tasty breakfast. Absolutely everything was perfect. 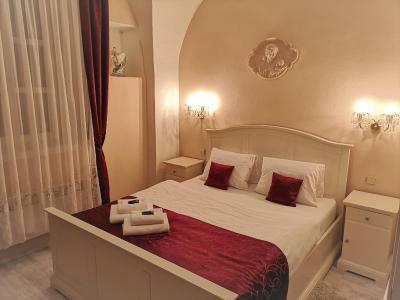 Excellent location in the city center, beautiful accommodation with interesting cafe. The windows were a little difficult to navigate, and to have the blinds closed the windows had to be shut. It was quite hot so we wanted the windows open, but we also wanted the blind down for some privacy. If you have heavy luggage, please note that you'll have to carry your bags a lot (through the café which has some steps, along a gravel path, and up a flight of outdoor stairs). For us it was no problem, but keep this in mind. The staff wasn't unfriendly, but not very welcoming either. Arrived late about 9 pm. No lights on and very difficult to find the place. Even though the owner expected a reservation, he was in his room upstairs and did not hear my heavy knocking on the door for 5-10 mins. Finally got his attention with the help from a neighbor. Good location. But the worst hotel during my 2-weak trip in Europe. Not better than a hostel. 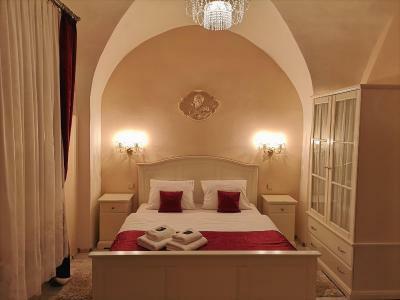 There were very comfortable, romantic rooms, especially recommended for pairs. Personel (by us there was Katka) was really kind and helpful. Great wines and breakfast! Everything GREAT!